Maybe it’s best not to complicate a complex thing. Tennis is hard enough. It is a game in which the mind’s mildest disturbances can move, as if by magic, a ball 3 feet from where it should be. Take courage, for instance. How much should experience matter when measuring it? Maybe belief can begin with making believe. 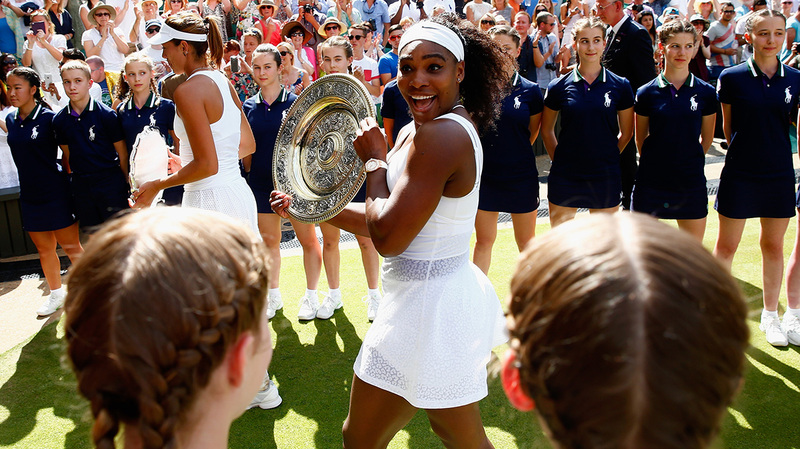 In the Wonderland that is Wimbledon, Serena Williams is the queen. Going into the final, she had won so often — three majors in a row and 20 overall, only two away from Steffi Graf’s all-time record — that it seemed impossible that she might lose. She was 38-1 this year; in her career, she was 20-4 in Slam finals. Already during this tournament, she had beaten three former Slam champions, while playing some of her best tennis — which is to say, while playing some of the best tennis ever played. She does, quite simply, almost everything better than anyone else: serve, return, go for broke, break, recover, dominate, create, vary, defend. So we took her for granted. If she won this match, her sixth Wimbledon title, she would have the chance at the U.S. Open to be the fourth woman to complete the calendar slam. History should be easy; the queen would merely need to breathe. Before her first Wimbledon match this year, Muguruza confessed to feeling perplexed: What was this, this business of tennis played on grass? She had trouble finding her footing, she said last week; she “couldn’t run.” And the ball bounced so low, while she had legs that went on for miles. She didn’t like it, she said, and her results so far showed: She’d won only one main-draw match at Wimbledon. That was two years ago. Each of the players she faced was a peculiar riddle. Against the 10th seed, Angelique Kerber, she fought off nine set points in a high-drama, hard-hitting 83-minute first set, winning the tiebreaker 14-12 — and then, even more impressively, overcame a huge second-set letdown to take the match. She survived the long runs of Caroline Wozniacki, and solved the devilish drop shots of Timea Bacsinszky. She overpowered the cutting and lobbing and defensive mastery of Agnieszka Radwanska in the semifinals, fighting back to win after watching a set-and-a-break lead slip away. At every stage, she had to test something in her game. She had to learn how to shrink herself to reach the balls at her knees. She had to grow to bear down on the ball on her serve, to use her height’s natural advantage. She has an astonishingly fluid forehand; her ball has that elusive quality of accelerating through the court. But her backhand was what impressed me most. She made the tricky stroke simple, took the weak links out of the kinetic chain. She has hardly any backswing and a contact point out in front. She could take the ball early, handle and return power, or find angles to open up the court. She played aggressively, exuberantly, always pushing forward, often to the net. (Coming into the finals, she’d approached 145 times, winning 68 percent.) She hit with purpose. More than a third of her shots landed within a meter of the baseline. No one gave Muguruza a chance against Serena. She was too young, too inexperienced; the occasion would overwhelm; she’d only faced counterpunchers, whereas Serena would strike the first blow. Who thought she had a chance? You could tell, Muguruza was imagining it: that golden crown. Serena had hit 13 double faults through the first six rounds. In the first game of the finals, she hit three. Muguruza broke — and then consolidated the break. Suddenly, instead of the inevitable dominance, there was a match. Serena was playing badly, and Muguruza seized the opportunity. Serena was forced to counter. “When I’m down or if I’m losing, I’m like, OK, why are you losing? What are you not doing?” Serena had said after destroying Maria Sharapova, the now–no. 2 player in the world, for the 17th straight time. Serving at 4-3, Muguruza hesitated with her forehand and simply sent it back. Serena stepped in and crushed the ball across the net. She started pushing Muguruza back, kept her off the baseline, took away the net. Serena defended and went for corners. She took advantage of Muguruza’s high-percentage but safer first serve and was aggressive with her returns. And despite throwing in an uncharacteristic eight double faults, she didn’t back off. Her hardest serve came in at 123 mph, and her average on first serves was 113; Muguruza’s fastest reached only 109. Perhaps more devastating than the speed was the unreadable spin and placement. She played with risk but margin, finishing with 29 winners to 15 errors. “Aces, winners,” Muguruza marveled afterward, “what could I do?” During one stretch, Serena won 12 straight points. At 5-1 in the second set, Williams stepped to the baseline to serve for the match. But Muguruza knew Serena was human: What seemed foregone was actually a chance. There was a sliver of hope — and she was right. Serena was broken at love. A wider sliver — because why not? Muguruza was shooting the moon. She went up three break points. Serena responded as Serena does, simply: with three aces and a service winner, to gain championship point. Here’s where the game got wonderful and weird and thrilling. Here’s where Wimbledon stopped being an excuse for toffs to day-drink and gave kids reasons to dream. Muguruza unloaded on her forehand, pushed into the court, and hit a heedlessly perfect forehand. Another deuce. And on it went — big returns; narrow misses; thrilling, daring defense. On her fifth break point, Muguruza hit a forehand winner. My delight swelled and burst out as laughter. After that, it happened very quickly. Match point, a forehand wide, and joy for Serena. On Saturday, Serena Williams became the oldest player ever to win a Slam in the open era. She has changed over the years, in both her game and the way she presents herself. She’s become more focused, more flexible; a better defender, and someone who is, as she put it this weekend, less desperate to win. Even in places like this, where she is far from loved, she has become uncommonly gracious. You could say — and it would be true — that she has grown up. But then you see her smile. “When you were kids, did you think that Serena would get 20 Slams?” her sister Venus was asked after their fourth-round match. Serena is still making believe.